Posted byMarjolijn	 May 1, 2017 February 6, 2019 Leave a comment on New Paper: What fuels the Wadden Sea foodweb? This study revealed that benthic primary producers (also called “benthic diatoms” or “microphytobenthos” see Figure below) are the most important energy source for the majority of animals higher up the food chain (worms, molluscs, crustaceans, fish and birds), and thus to the whole food web. Here, we used stable carbon isotopes, to report on the primary carbon sources for consumers and their spatial variability across one of the world’s largest intertidal ecosystems (Dutch Wadden Sea; 1460 km2 intertidal surface area), at an exceptionally high taxonomic (178 species) and spatial resolution (9165 samples from 839 locations). In addition, we found large spatial heterogeneity in the δ13C values of benthic primary producers and primary consumers emphasizing the need for spatially explicit sampling of benthic and pelagic primary producers in coastal ecosystems, and inclusion by long term ecological research and environmental monitoring programs. These findings have important implications for our understanding of the functioning of ecological networks and for the management of coastal ecosystems. 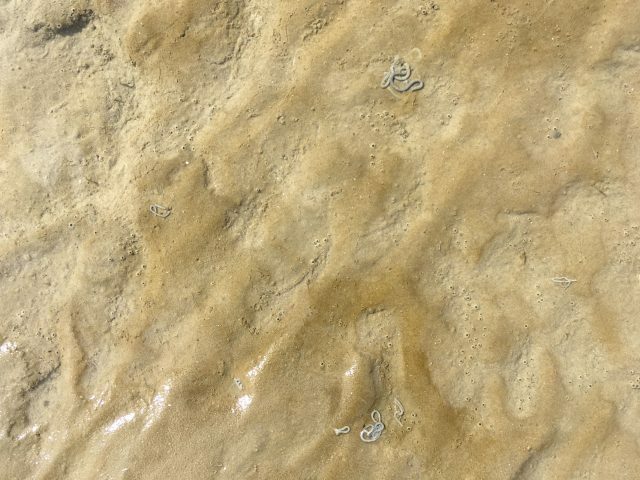 For example, this may direct the protection of intertidal mud flats that sustain the dominant primary producers from bottom disturbing fisheries. This research was a collaborative effort of three Dutch research institutes; University of Groningen, Netherlands Institute for Sea Research (NIOZ-EDS & NIOZ-COS) and two nature conservation organisations (Natuurmonumenten, Staatsbosbeheer) within the Waddensleutels program. This program focused on the importance of habitat modification by reef builders (predominately mussels and oysters) for food web dynamics and biodiversity in the Wadden Sea. This research was funded by the “Wadden Fonds”. 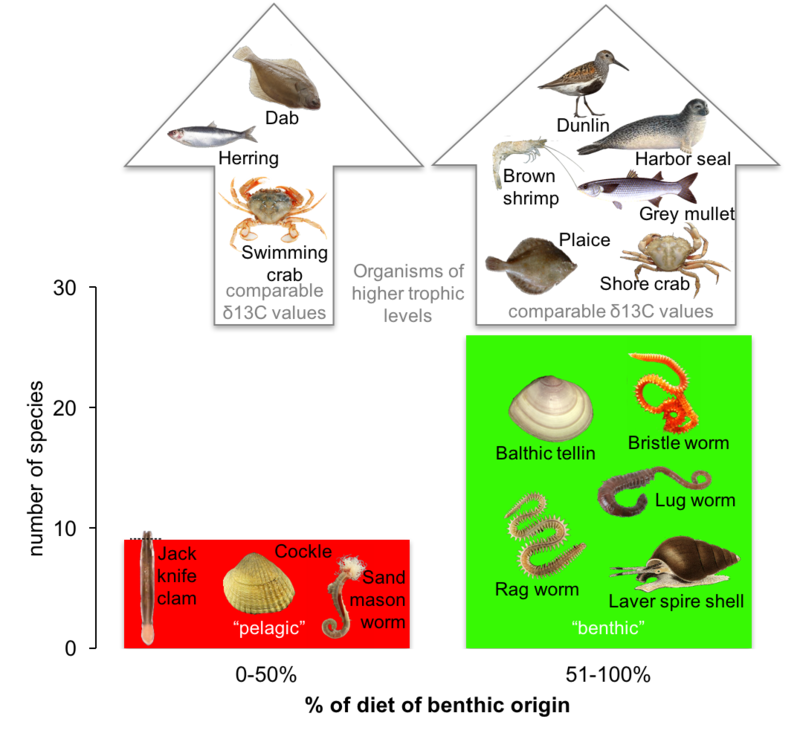 Conceptual diagram on the importance of benthic production to species higher up the food chain. Relative contribution of benthic primary production (%) to the diet of 35 most common benthos species of the intertidal flats of the Dutch Wadden Sea classified into 0-50% (red) and 51-100% dependence on benthic algae production (green). Bars include figures of some of the most abundant species of each 2 classes. Examples of species of higher trophic levels with “benthic” or “pelagic” of “intermediate” δ13C signals are presented inside arrows (Christianen et al. 2017 Ecology for details & citation).